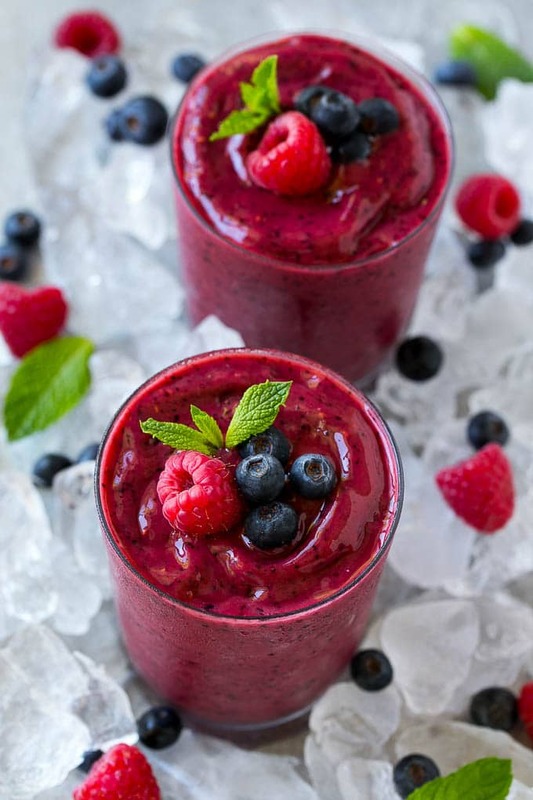 This frozen fruit smoothie is an icy blend of apple juice and frozen blueberries, cherries, raspberries and mango. An easy nutrient packed drink that’s perfect for a hot day. 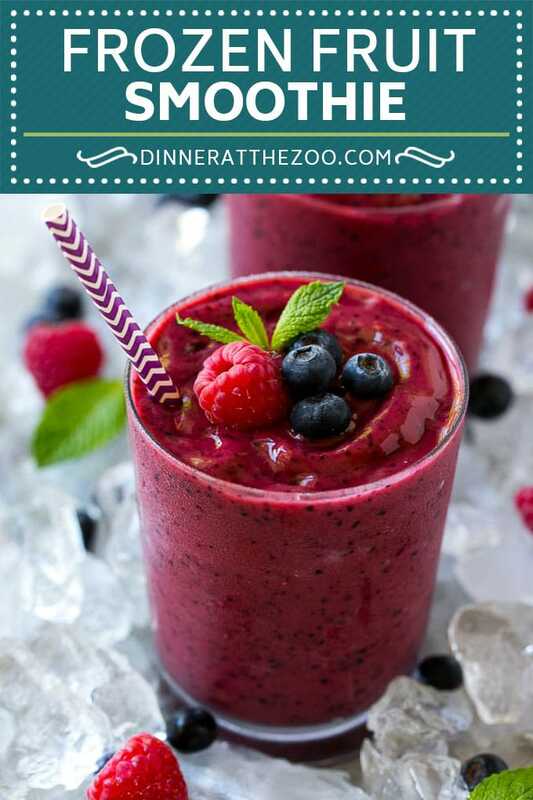 I make frozen fruit smoothies at least once a week – they’re delicious, healthy and the perfect way to use up all those odds and ends of fruit in my freezer! I don’t know about you, but here in California it’s been hot, hot, hot! 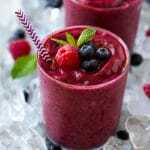 I whipped up some of these frozen fruit smoothies for my kids to ward off the heat. They’re a quick and easy snack, and full of icy cold fruit to help keep you cool. HOW DO YOU MAKE A FROZEN FRUIT SMOOTHIE? 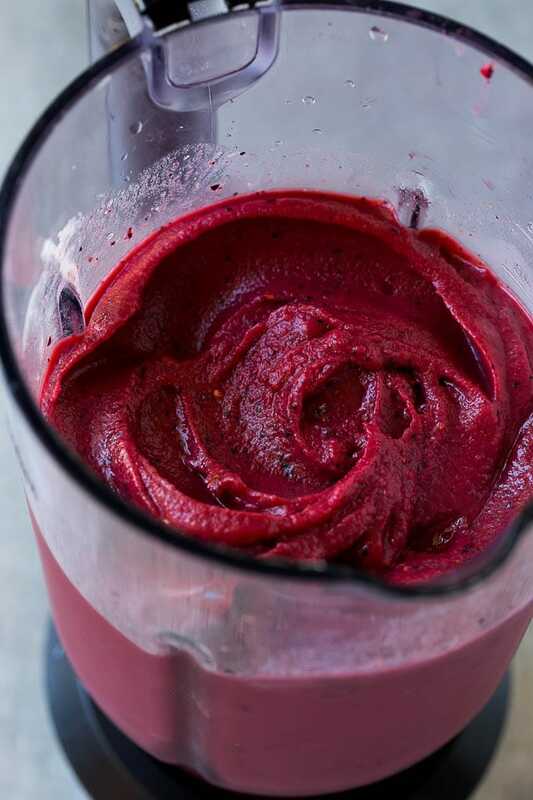 I personally have a blender meant just for smoothies but it’s not necessary; any blending machine will work. 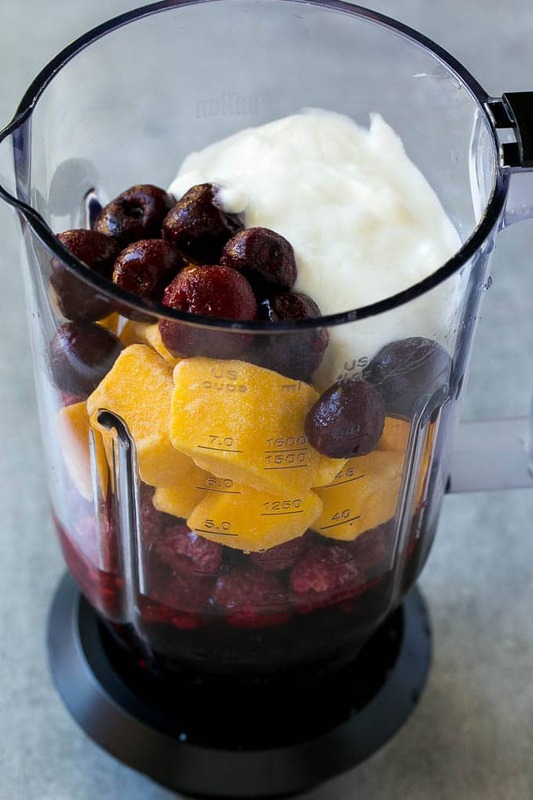 Toss your blend of frozen fruit, juice, and Greek yogurt into the blender and mix until smooth. I chose to use blueberries, cherries, raspberries, and mango for a tart, yet sweet, blend of fruits. This recipe makes two servings but can easily be adjusted to make only one serving, or more servings, whatever you desire. Simply cut the recipe in half for one serving. If you double the amount of ingredients called for, remember that it will bump it to four servings since this is enough to make two servings. Each serving is around 16 ounces each. You can even use milk, almond milk or coconut milk instead of juice for your smoothie. 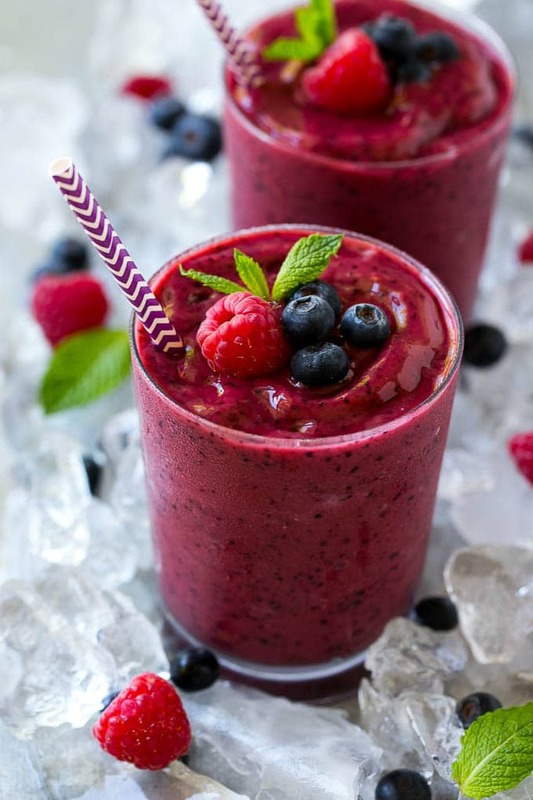 WHAT ARE THE HEALTH BENEFITS OF A FROZEN FRUIT SMOOTHIE? Although smoothies are sweet, making it seem like they’re a treat more than a health benefit, they actually full of nutrients. A fruit smoothie contains large amounts of folate. vitamin C, and potassium. Most fruits are a great source for these nutrients and one fruit smoothie can contain up to 2-3 servings of fruit. The Greek yogurt also adds a good dose of protein, which help keep you full for longer. DOES THE FRUIT NEED TO BE FROZEN IN A FRUIT SMOOTHIE? If you want to make a frozen fruit smoothie and don’t have any frozen fruit on hand, add ice to your mixture. If you don’t add frozen fruit or ice, your smoothie won’t be thick and frosty. If you don’t mind this, then you’ll be fine to continue. I highly recommend using frozen fruit because it tends to blend better than straight ice. It’s not pleasant to bite down on chunks of ice in a smoothie! This fruit smoothie recipe is so easy that we make them most days during the hot weather. You won’t hear me complaining. They’re a lot healthier than ice cream and if making them keeps the want for ice cream at bay, I’m all for it! 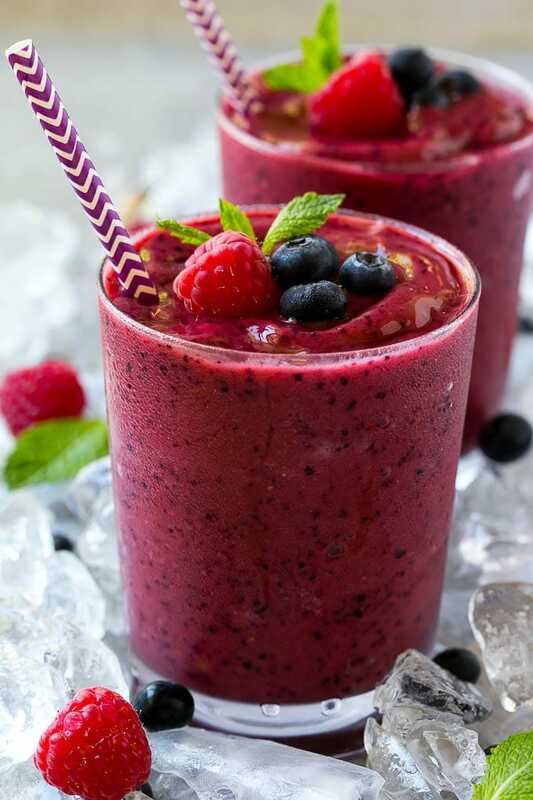 This frozen fruit smoothie is an icy blend of apple juice and frozen blueberries, cherries, raspberries and mango. An easy nutrient packed drink that's perfect for a hot day. Place the juice, fruit and yogurt in a blender. Pour into 2 glasses. Garnish with additional fruit and mint sprigs if desired. If you use almond milk instead of apple juice would you still add the yogurt? It’s up to you, if you’re trying to avoid dairy you can omit it, but the smoothie won’t be as creamy without it! Thanks. I wasn’t sure if adding both would change the taste or consistency. Incredibly delicious. I have to make this soon! Can this be made in a magic bullet? Sounds delicious. Thanks for the recipe. Love it!!!!! I used mango juice, and it was really good! Thanks for the recipe. That looks so packed with goodness and really perfrct for this hot weather. This looks so good! I love a good smoothie in the morning and my son has found a new love for them as well. We’ll have to try this one out. Thanks for sharing! Wow your frozen fruit smoothie is on-point perfect for this freakin hot summer. And its healthylicious! OMG! it looks perfect! i love smoothies! they are good and filling! and with that heat, it is going to be so good and refreshing! This looks and sounds like a delicious smoothie! I love the purple straw too! Thanks for sharing. I’ll have to try this out with our family. What a great combination of ingredients. That sounds really refreshing! I love making smoothie’s especially for breakfast! This one looks so yummy and a like a great one for the summer! I have never used apple juice for my smoothies. I wonder how it tastes. You said it is neutral. I always use OJ. I like that taste. This smoothie looks delicious. I love the deep purple color too.